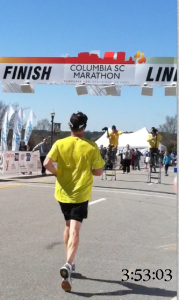 Home » Posts Tagged "Columbia SC Marathon"
After the 2012 Columbia Marathon, I didn’t know if I’d run it again in 2013. Oh, there was nothing wrong with the race. In fact, it was an extremely well organized event, and I had a good race. I still feel that way a little bit, but one thing that has changed that I really didn’t count on – my ability to do marathons more frequently than I ever imagined (I’ve done a road marathon and a trail ultra marathon since the last Columbia Marathon). 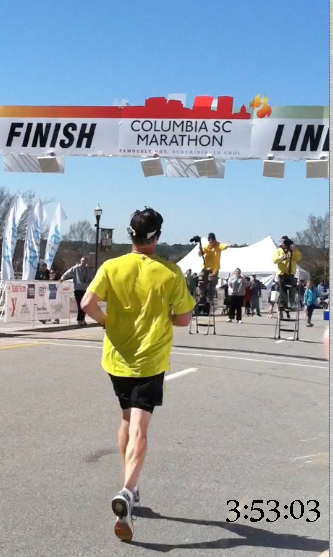 So, when race director Dan Hartley announced some route changes and an awesome shirt, well, I was in. Plus, I get to sleep in my own bed the night before! With the circus in town during this year’s race weekend, Dan Hartley had to make some route changes and avoid the Colonial Life Arena side of Assembly Street. The start has been altered to begin on Sumter Street next to the South Carolina State House. The finish has been modified to come down Main Street and finish in front of the State House at the corner of Main and Gervais Streets. Then, all post-race festivities will be on State House grounds. Although, I appreciated (and needed!) the downhill finish at last year’s event, this is a very nice change for 2013 (and beyond?). Unfortunately, these changes didn’t take out any of the toughest hills on the course! For course map and elevation click here to go to the official website for the marathon. Growing up, I played a lot of organized basketball. 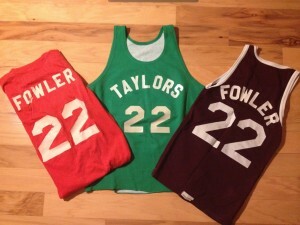 Early on, I had the number twenty-two and it became my favorite. I was able to keep that number most years. Now that I run marathons, the number twenty-two has a different meaning. Now, it means twenty two miles is all I have in me before I hit “The Wall”. Below I’ve included a chart of my marathon splits (minutes per mile) from each of my first four marathons. Being a nerd, I record this info. For the last three marathons my GPS watch did it for me. On my first, in 2009 before my GPS watch, I had to press the watch split button at each mile marker, then go back and review. I threw the numbers in an Excel spreadsheet and made a chart of the data. You can see that the wheels get wobbly after mile twenty, then completely come off after mile twenty-two. My goal for this week’s race is to beat this trend. Unfortunately for me, the second time up the long Trenholm Road hill is about the twenty-two mark. We’ll see. My time goal is to beat 3:45, which would be a personal best. Off to work on a playlist! PS. The weather forecast looks good. Should be around 40 degrees for the 7:30am start, then warm up nicely to almost 60 by finish.